UK television and radio news and programmes are dominated by tomorrow’s planned nuptials between Prince William and Kate Middleton. Hard news journalists and gossip columnists alike are united in their desire to wring every scintilla of Royal press office-fed ‘news’ in the hope of a new twist on the Big Day. Syrian ambassador to the UK is invited. Then disinvited. Are the bridesmaids wearing fascinators? A weird blend of the newsworthy and the out and out frothy. Everything I’ve heard makes me think William and Kate are as beautiful inside as out. But enough already with the 24/7 coverage. We don’t need yet another vox pop interview outside of Westminster Abbey featuring a man wearing a knitted Union Jack teacosy for a hat, clothed in a t-shirt stating ‘Diana Would Be Proud’ (I’m not making that up). It’s hardly the happy couple’s fault but it’s got to the point where I am at this moment listening to an obscure station featuring 80s rock classics. So, with Bon Jovi angsting in the background I am elbow deep in flour, butter and leaves making a cake – for Kate. Couldn’t resist. The wedding coverage is so saturating that it has taken over the decision making section of my brain and commanded me to make a delicate, fragrant cake in honour of our equally delicate and fragrant soon-to-be princess. So, temporarily abandoning my healthy eating perch, I have a rather nice cake recipe fit for a future queen. Before making this cake I was in the UK temple of Italian delicacies that is Valvona & Crolla. To be honest I had only nipped in to use the restroom, but ended up with a paper sack full of feathery baby globe artichokes, another sack with nobbly, fat Sicilian lemons and a heavenly smelling Italian white sourdough round. 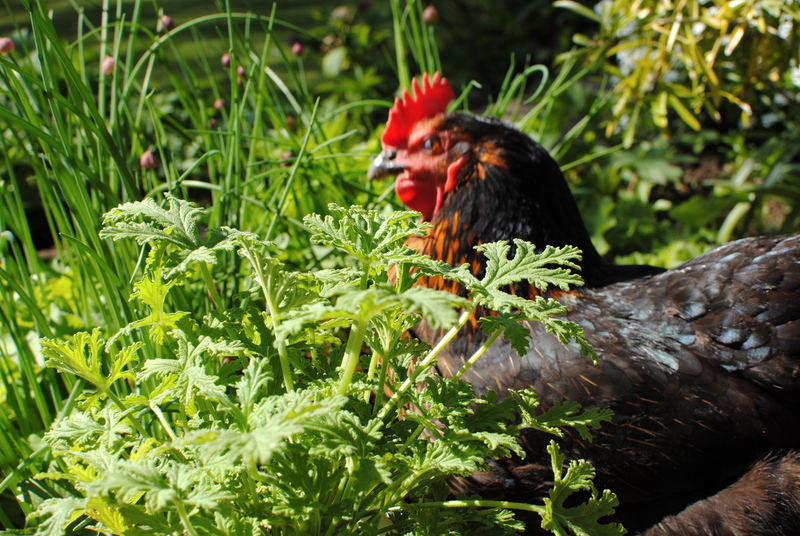 I thought that the latter would make a perfect base for crayfish, avocado and dill sandwiches, and maybe egg and cress ones too. Nothing fancy or time-consuming, just wholesome and perfect for nibbling while watching the ‘I do’s’ and seeing if Harry has painted ‘Help Me’ on the soles of his big brother’s shoes. The lemons were destined for this cake, but I had thought of the idea earlier in the day after a trip to the German discount store, Lidl. Now, if you aren’t familiar with Lidl, first of all why not. It’s brilliant. Secondly, it’s about as opposite to the ambiently lit, wood panelled V&C as you can get, but a fantastic place for basics like porridge oats, olive oil, fresh vegetables and toilet paper. They also have weekly themed specials, usually a bit bonkers and unnecessary, such as horse week, when you can get fetlock warmers. This week Mr A and I were in there for the gardening gear when I smelled the unmistakeable citrus and green smell of lemon geranium. I loved that smell growing up: crushing the leaves between my wrists and under my nose (odd kid). 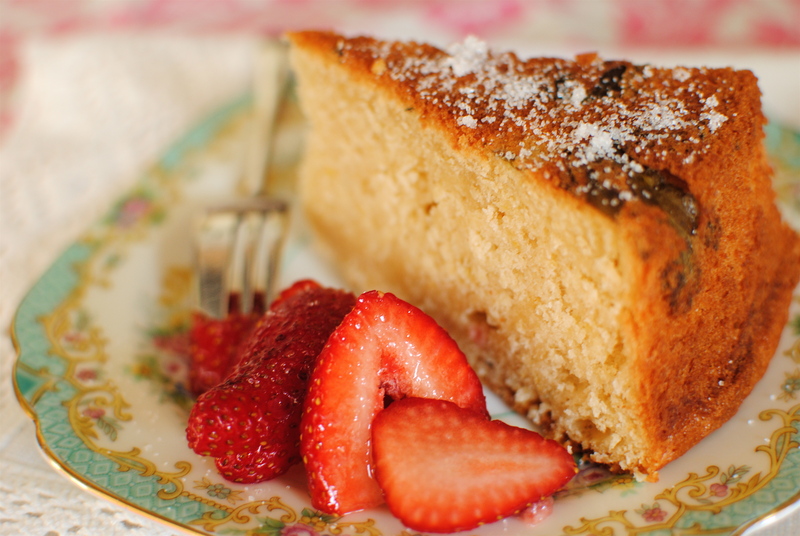 I have seen US recipes for lemon geranium pound cake over the years but have never made one, lemon geraniums not always being around in Scotland. With an eye toward fulfilling a culinary gap I immediately snapped up some of the last of these crinkly-leaved plants. Mr A has planted them out in free-draining soil in a sunny spot where its evergreen leaves will soon bear blush-pink flowers. Lemon geraniums, and other scented geraniums such as rose and mint, are actually pelagoniums, originating in South Africa but cultivated in Europe since the 17th century. The Victorians were very fond of them, growing them for the year-round scent of their evergreen leaves and to include in mussie-tussies – small cut-flower bouquets. 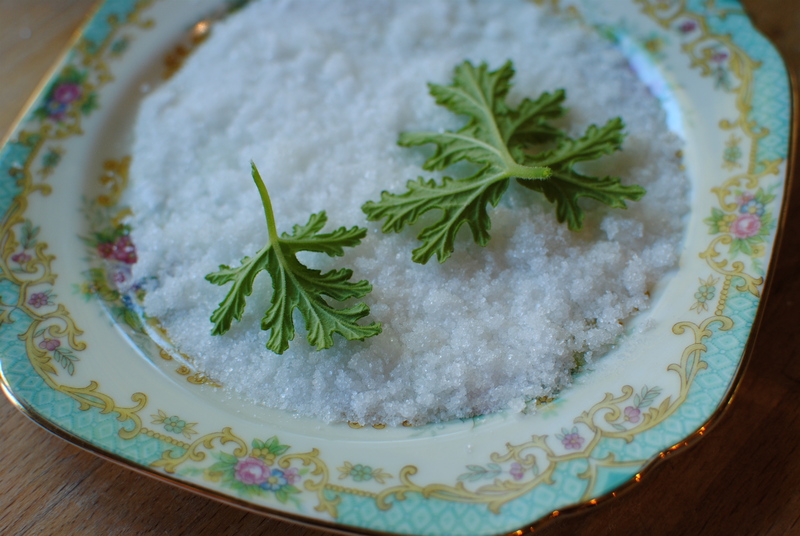 Like other herbs and edible leaves, Pelargonium crispum has many culinary uses, such as in marinades, sweet vinegars, fruit drinks, teas, jellies, as pretty ice cubes and to flavour sugar (just layer leaves in a container of sugar). They have nothing to offer medicinally but lemon geranium would make a refreshing citrussy inclusion in a potpourri or herb pillow. This recipe is my somewhat less buttery and sugary version of a typical lemon geranium cake, which itself is much like a madeira cake/pound cake. Many of the recipes I viewed had quite a lot of sugar and up to 6 eggs – way too rich for many tastes. Here, I’ve used just three large eggs, with the whites being whisked to a soft peak lending a lightness that my inclusion of fibre-rich ground oats probably necessitates. 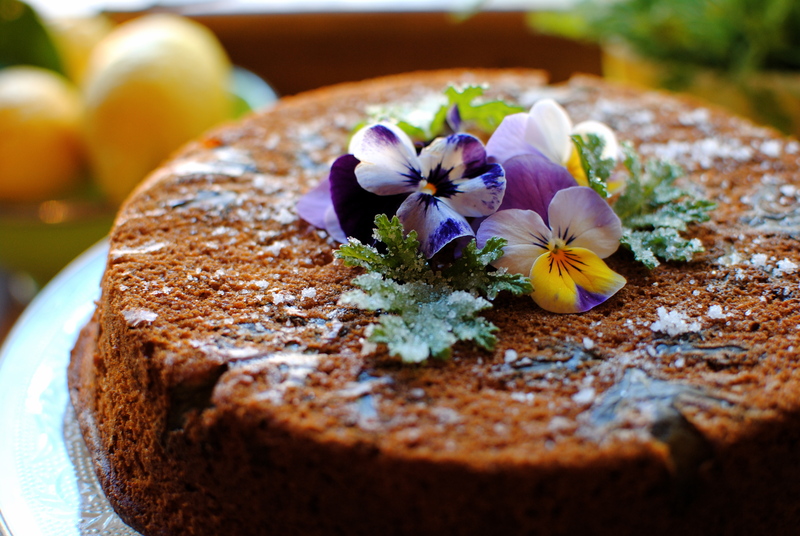 But, in common with all lemon geranium cakes the leaves line the bottom of the tin and infuse the batter as it bakes. Extra chopped leaves and lemon peel are added to the batter for extra oomph and scent. I doubt Kate and William will have such a cake tomorrow or maybe ever, but I do think it’s a bit special. Just like them. The day before making the cake lightly brush each leaf you want to use with egg white and then either dip in caster sugar or sprinkle over with the sugar. Leave on a rack to set overnight. Butter a 22cm/10 inch tin and base line with parchment paper. 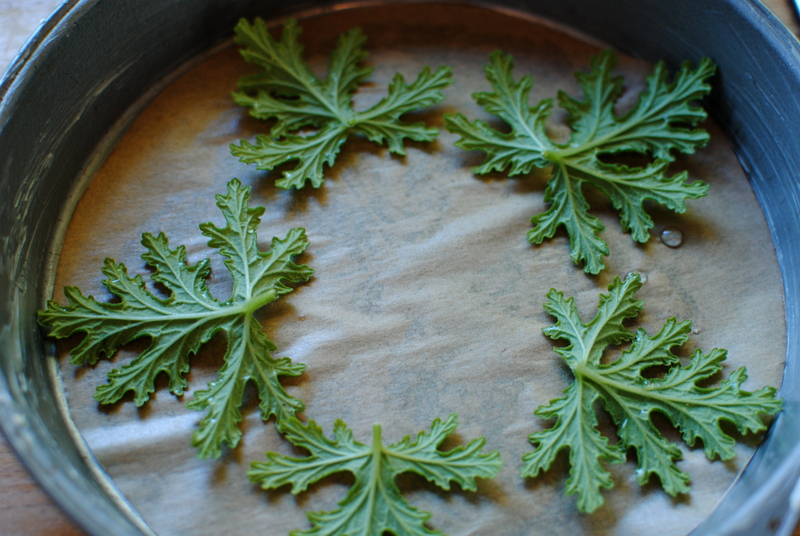 Place geranium leaves rough side down onto the bottom of the tin – I used five large leaves to line the edges but you can cover the bottom entirely if you like. Heat the oven to 180C/350F. In a freestanding mixer, or using an electric whisk/beaters, beat the butter until light and fluffy before adding the sugar and beating for a further five minutes. In a separate bowl sift together the flour and baking powder; stir in the ground oats. Using a small bowl whisk the egg yolks into the milk; add in the vanilla. Add one one-third of the egg-milk to the butter-sugar mixture, along with one-third of the flour, and mix until well-combined. Scrape down the sides and add the remaining eggy milk and flour. 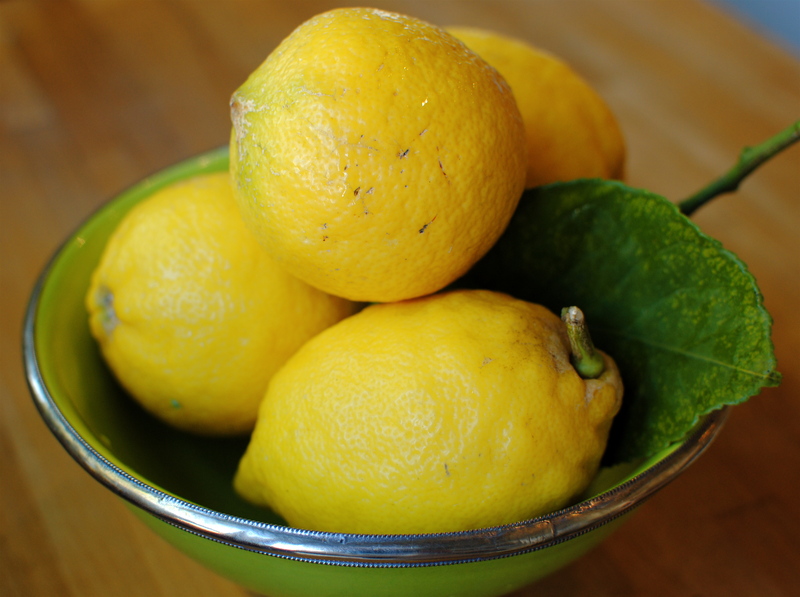 When this is combined fold in the lemon juice, zest and lemon geranium leaves. Whisk the egg whites in a clean bowl until you achieve stiff peaks. Using a large metal spoon thoroughly fold one scoop of egg white into the cake mix, using a figure of eight motion to really get it mixed in without knocking out too much air. Fold in the remaining egg whites until all of the white is completely dispersed. Spoon the batter into the tin and pop into the oven for about an hour, or until the top is golden brown and possibly a bit cracked. Check at 45 minutes, but depending on your oven and if you’ve used a different sized pan, you may need to bake for over an hour. Remove from the oven and allow to cool a bit in the tin before turning out so that the bottom is uppermost. The cake in the photos are quite brown; this is because it is the always-darker bottom that’s on show. 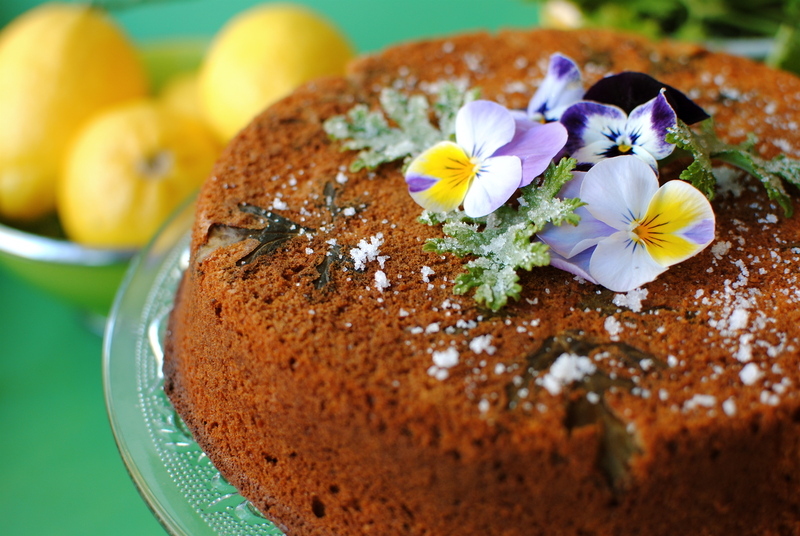 When the cake is cooled top with sugar-frosted leaves and any chemical-free small flowers, such as violas. Many recipes call for a sugar glaze. If you want to do this mix together the juice of one lemon with 50 grams of sugar; pour this evenly over the cake as it comes out of the oven. Lemon-tastic. 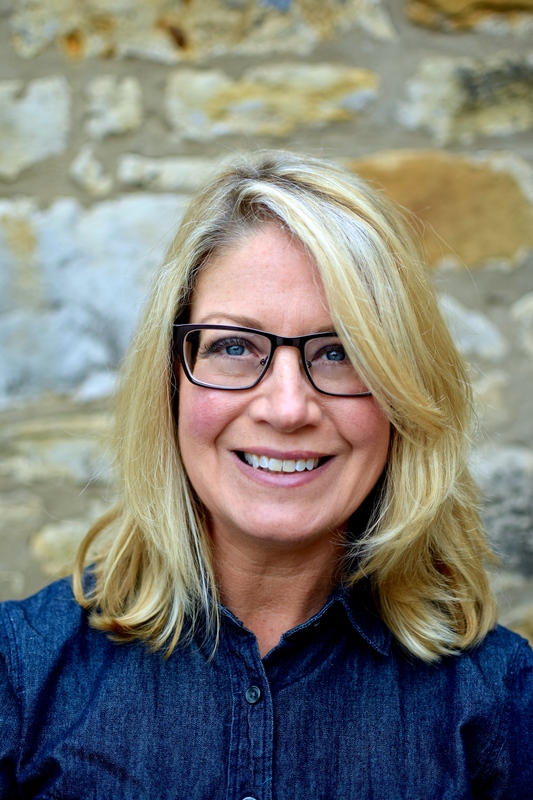 Brilliant words, stunning photography and a rather beautiful looking multi-sensory cake….. I too used to scrunkle up lemon geranium leaves (in my Grand parents house) when I was little. Lovely. Very kind comments, Niki. I’m glad to know I’m not the only ‘scrunkler’! Haven’t been to Lidl for ages, so going to do my shopping there after work today, wonder if they will have lemon geraniums, unlikely but you never know..